Are you planning to buy a digital camera for vlogging which is really good at its performance and can appease you with its video quality? Then, first of all, you must take a look at some Sony vlogging camera 2018. Among all the cameras which is available in the market, you will find the more positive result in case of Sony a6000 for vlogging. You will find some extraordinary features in this camera which is enough to make your decision to have a one for your own. In this competitive market, this amazing camera is manufactured considering all the factors which worth to be the best Sony vlogging camera. Now, let’s take a look at the marvelous features of this magical camera. ISO 100 to 25600 and expandable to 51200. 179 point AF (auto focus) and 25 contrast detect point. Continuous shooting up to 11 FPS. LCD screen of 3 inches with 921000 dots. Tilting LCD for high and low angle framing. With the help of this extraordinary camera, now you can perform your job more correctly and conveniently. In continuous shooting mode, this a6000 can capture at 11 frames per second rate. It will provide you more detailed videos and images because of its fastest autofocus facility. 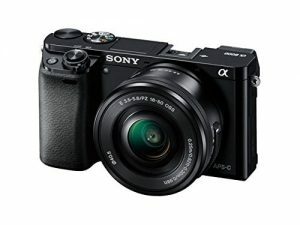 Now you also may have the unique experience of Sony a6000 vlogging camera. Sony a6000 is capable of competing almost all the DSLR camera from the viewpoint of its quality of capturing. This mirrorless digital camera comes with the same size of APS-C sensor like the most DSLRs present in the market. It is more versatile for its E-mount system and interchangeable lenses. You can have the stunning enlargements and unbelievable details due to its 24.3 MP Exmor APS HD CMOS image sensor. Sony a6000 is updated with the recent technologies and as a part of this, now it is very easy to share any files from your camera. You can even control the camera by the help of your compatible smartphone and the PlayMemories Camera app. The NFC facility makes it more acceptable to everyone. So, at these present days, it is more convenient for anyone to use this Sony a6000 vlogging camera. Now it is very easy to make any video of full HD quality when you a Sony a6000. You can record in a quality of 1920 x 1080 in cinematic 24p. Its 179 point autofocus system makes it more marvelous for making any video. It also has the property of 25 contrast points. Its tilting LCD screen makes it more convenient to shoot from different angles. Sometimes it is very much important to capture any situation even in a low lighting area and it gets more difficult to take the memory of that moment. But when you have a Sony a6000, then this problem is not a big issue due to its facility of capturing low light photos. It has the capability to record with gorgeous details in low light ranging ISO from 100 to 25600. It can be extended up to 51200 which gives you extra advantages. With the full DSLR quality, with the help of Sony a6000, you can control it very easily and shoot like a pro. All the function of this camera is so well organized that you can get easy access to them. There is two dial on top and a rear-mounted control wheel which is very helpful for quick selection of modes and setting. There are also seven customizable buttons. So, this is a perfect decision if you consider Sony a6000 for vlogging. This is an outstanding camera with plenty of features. Taking all the thing into consideration, you can say this camera as the best Sony vlogging camera with flip screen 2018. Keep it on your count. Thanks for finally writing about >Sony a6000 for Vlogging (Famous Vloggers First Choice) <Loved it!